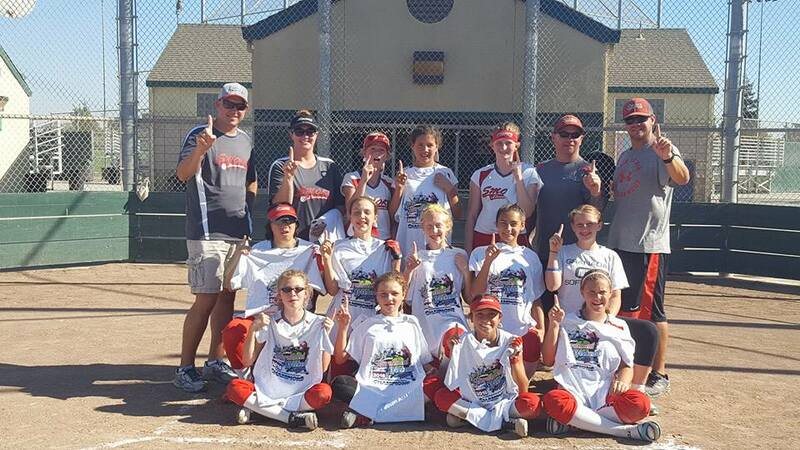 Congrats SMOKE 13U for taking 1st Place in the Diamond Classic on Sept 25th, in Reno, NV! SMOKE went 5-0 all weekend and ending up beating Fallon Greenwave 5-0 in the gold bracket. Awesome job girls and coaches! Livermore SMOKE 13U brings home the Championship this weekend beating LGCS Magic 11-0! Undefeated 5-0 this tournament weekend in Hayward. These girls outscored their opponents 37-1. Stellar defense, hot bats and phenomenal pitching contributed to complete dominance over their competition. The chemistry this team has is priceless and it shows on the field. Way to start the fall season! Congratulations SMOKE! The 8U B Girls finished off their summer season with a heartbreaking 4-2 loss to UC Fury in the Championship game. The girls battled back from a 4 run deficit in the last inning of the semifinals just to get to the championship game. This wrapped up a wonderful summer season for the girls with a combined record of 26-5. 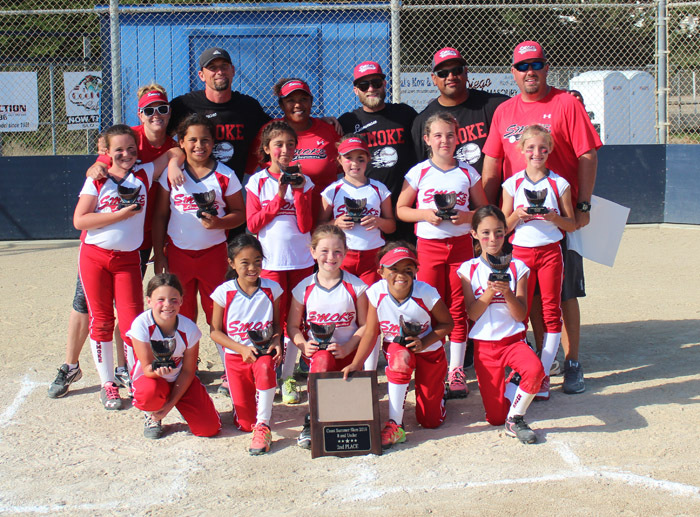 The 8U B Smoke girls completed an undefeated weekend going 6-0 and winning the championship versus East Bay Impact by a score of 7-1. The girls scored a total of 39 runs in their five games while only giving up 5 runs. 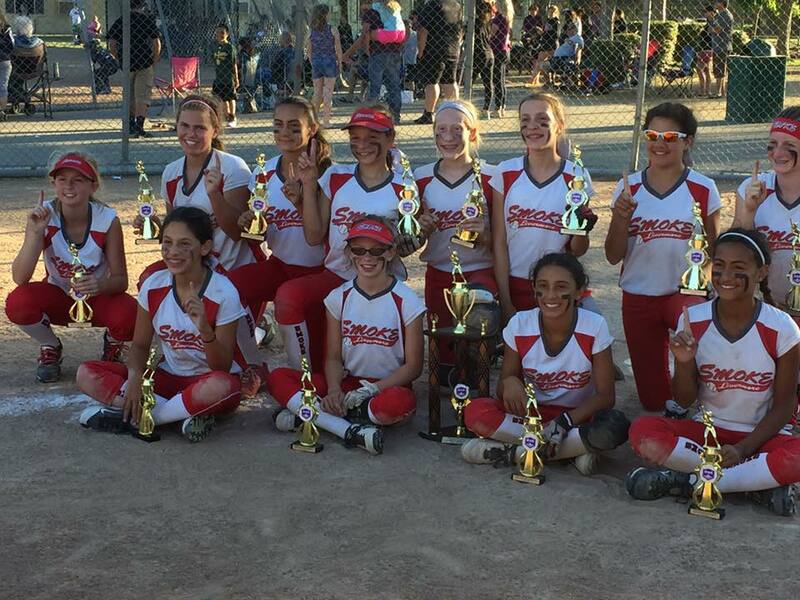 Livermore SMOKE 12B ended their summer season on a high note. 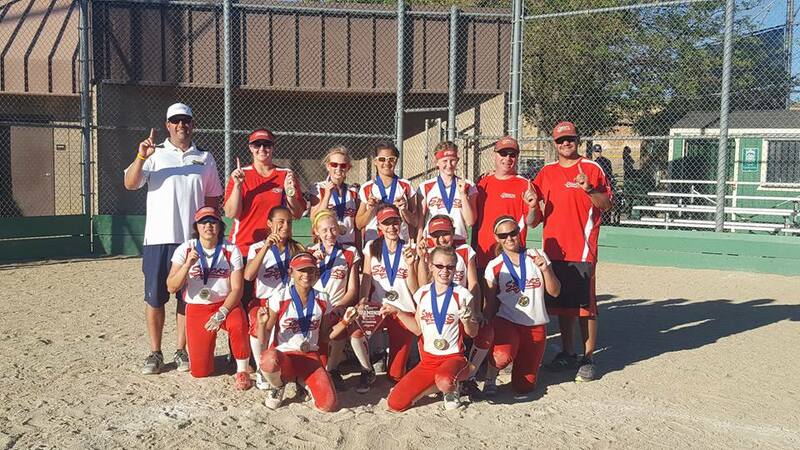 SMOKE took 1st place in the Capital Sports Association Junior Olympic Tournament July 30-31 in Napa, CA. SMOKE went 2-1 in Saturday pool play. Championship Sunday saw SMOKE sail through games one and two against Petaluma Steele Breeze and Santa Rosa Red Barons to meet Foster City Flash in the championship game. After a close first two innings, SMOKE broke out the bats and pulled away in the third inning. Nayeli Tia went 2-3 with 3 RBIs and struck out 5 in 4 innings of work. Erika Beakey and Iliza Shields also went 2-3. SMOKE had 9 runs on 10 hits putting the final score at 9-4. Solid defense and hot bats have led SMOKE to the championship game in all five of their tournament appearances this year. They ended the season with three 1st place trophies and a lot of great memories. 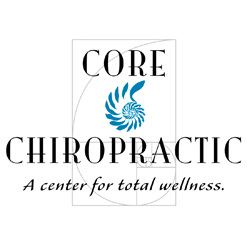 Top Row: Kendall Waugh, Erin Schrader, Karen Castro, Erika Beakey, Brooke Bowles Sadie Wolfe, Iliza Shields, Melissa MacDonell Bottom Row: Emma Hatcher, Zoey Figlenski, Keana Castro Nayeli Ti'a. 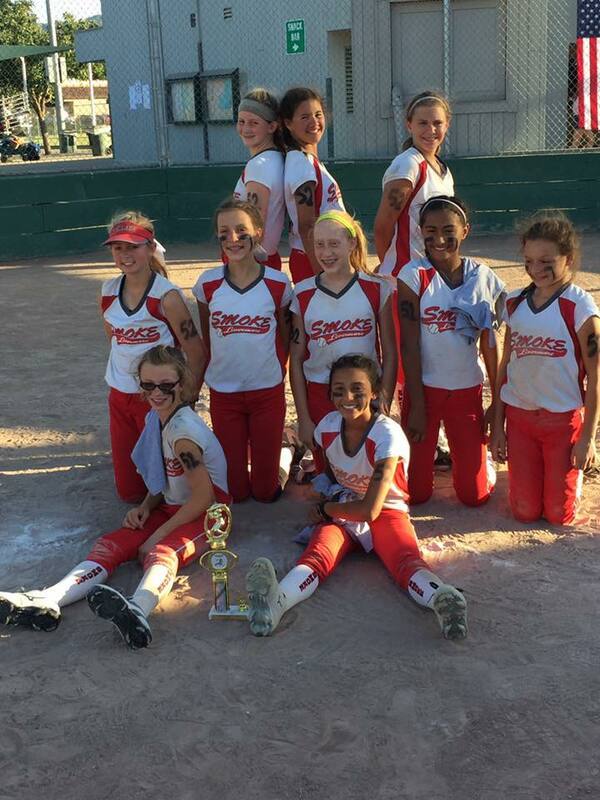 Livermore SMOKE 12B brought home silver in their fourth tournament appearance this year at the July 4th PGSL Summer Classic. An early win against Castro Valley Synergy on Friday night sent SMOKE into Saturday on a high note. SMOKE went full steam ahead against San Lorenzo Heat, defeating them 15-0, but later fell to MVLA Nova 7-3. Championship Sunday saw SMOKE put Pleasanton Phantom down 11-3 and later inch out a win against Santa Clara Sparx 2-1. SMOKE met MVLA Nova again in the championship game and unfortunately could not pull out the win, falling 5-2. 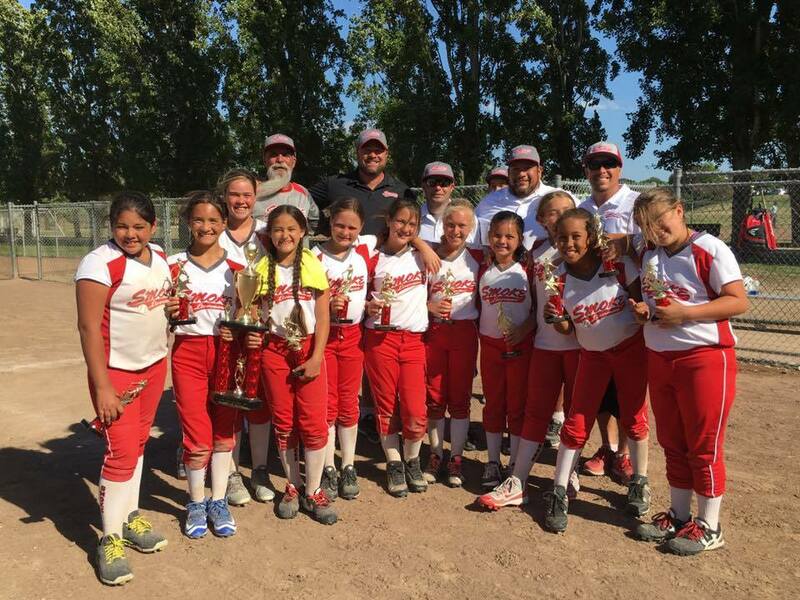 Sonora, CA- Livermore Smoke 10U B wins the Championship in Sonora at the Sierra Gold Rush Mountain Blast Tournament. 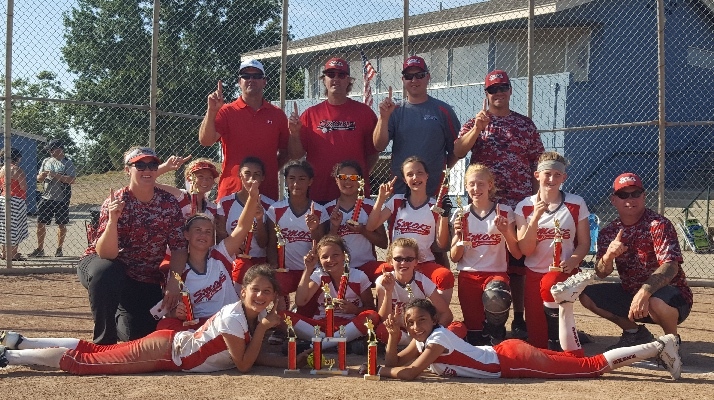 The girls from Livermore backed up a 3-0 Pool play on Saturday by finishing the tournament undefeated and knocking out the also previously undefeated Central Valley Swarm in the Championship Game by a score of 11-1. Offensively, Smoke was led by London Moody and Kaitlyn Aguilar with 10 RBI each over the weekend. 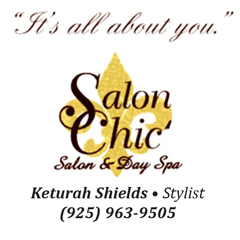 Maggie Robinson was a perfect 6 for 6, Alizabeth Ruiz was 4 for 5, Sierra Black 4 for 5, Rhiannon San Miguel was 6 for 8 and Hailee Hartman 5 for 7. Sydney Aguilar scored 6 times, Sophia Raridan scored 4 times, and Jay Cosgriff scored 4 times while also going 4 for 8 at the plate. On defense, Smoke was led by strong play at SS by Maggie Robinson, London Moody in Center field as well as Audrey Sweet at Second Base. Pitching was stellar this tournament as well. The combination of Kaitlyn Aguilar, Sierra Black, Audrey Sweet, Delilah VanderBeek and Sydney Aguilar combined to go 5-0 with 31 Strikeouts in 17 innings pitched. The Quintuplet of pitchers was able to maintain a team ERA of 1.41. Livermore Smoke has compiled a record of 20-10 (2 Championships and a 2nd place finish) this summer season. 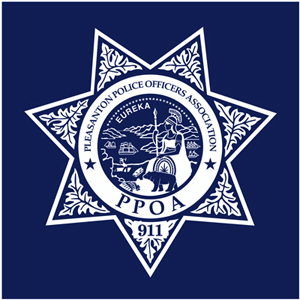 They have one last Summer Tournament in Medford Oregon at the ASA 10B Western Nationals from August 1st through August 7th. Good Luck Girls! 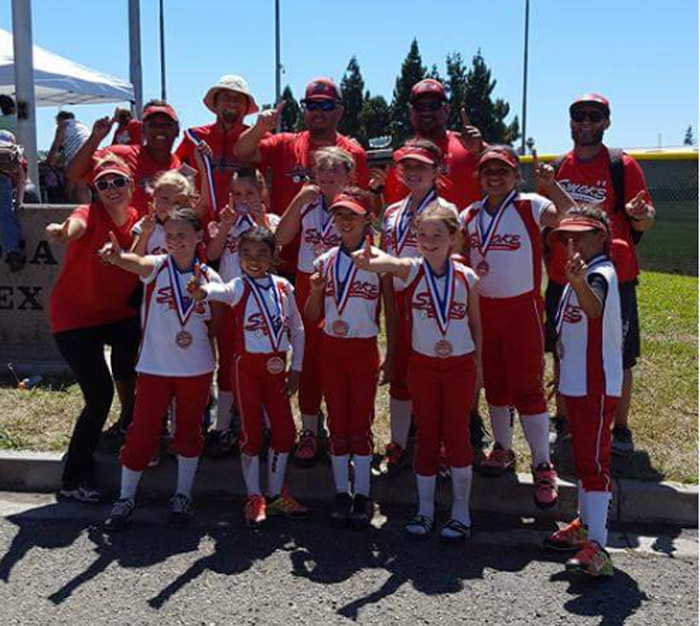 The 8U B Smoke girls traveled down to Morro Bay and took second place, losing their only game in the championship 2-1. Over the weekend, the team completed two no hitters and gave up a total of 3 hits all weekend. 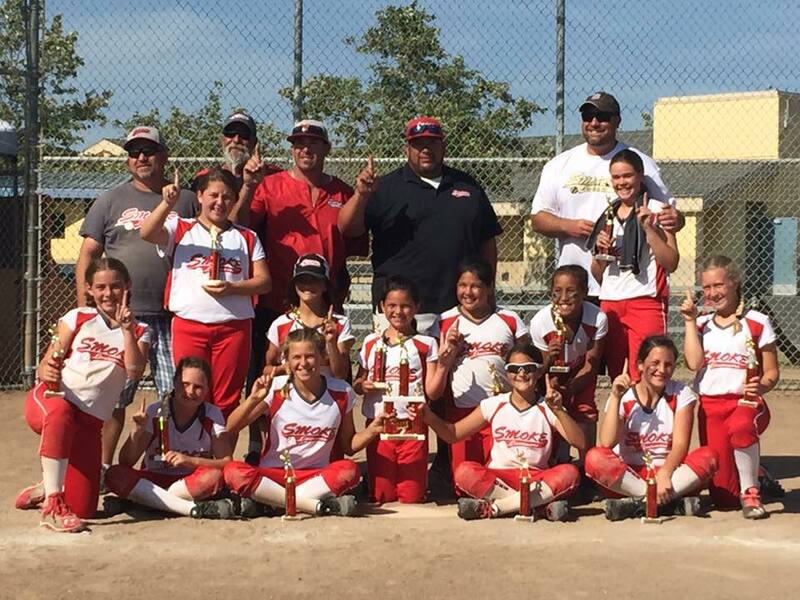 Livermore Smoke 12B brought home the silver in last weekend’s Nor-Cal ASA “B” Championship tournament in Sunnyvale. The girls had a long road to the championship game. Smoke fell 6-4 to MVLA Nova in their first game, sending them to the loser’s bracket. Smoke battled hard for wins in their next three games. Smoke defeated San Mateo Slammers 8-7 with Nayeli Tia going 3-3, including a home run. Iliza Shields was 2-3 with a single, triple and a walk. Winning pitcher, Melissa MacDonell, allowed only two hits and no earned runs. A win against Foster City Flash saw Nayeli Tia club another two homeruns, resulting in four RBIs. Sadie Wolfe also had a hot bat, going 2-3. In their third attempt this summer, Smoke defeated MVLA Nova 7-5. Smoke’s lead-off Keana Castro went 2-5 and Kendall Waugh went 2-4 with a double. This led Smoke to the championship game against the undefeated Campbell City Crush. Smoke’s Kendall Waugh and Nayeli Tia battled the heat on the mound. Tia had four strikeouts. Brooke Bowles was solid behind the plate. Zoey Figlenski had a slap hit up the middle and one RBI. Though Smoke fought the elements and a very competitive team, they gave it their all, ultimately falling 10-2. Livermore Smoke 12B brings home another 1st place trophy. Smoke 12B went 4-0-1 at the 2016 Benicia Del Holson Tournament June 11-12, 2016. After ending their first game of the tournament in a tie against the Pleasant Hill Panthers, Smoke 12B went on to run-rule ABGSL Sting 12-0. Nayeli Tia went 2-2 with a double, a triple and 5 RBIs. Kendall Waugh and Karen Castro also went 2-2. Winning pitcher Melissa MacDonell threw a quick 3-inning shutout! Meeting the Pleasant Hill Panthers again later in the day, Smoke 12B avenged their earlier tie by winning 8-1. Nayeli Tia maintained her streak going 3-3 at the plate with a single, double and triple. Sadie Wolfe and Iliza Shields went 1-2 with singles. On championship Sunday, Smoke 12B was matched up with ABGSL Sting again for the semi-final game. On 15 hits, Smoke 12B outscored Sting 11-2. Nayeli Tia homered, Keana Castro went 2-3 with a single and a triple. Brooke Bowles went 1-1 with a single. In the championship game against Union City Fury, Smoke 12B fell behind by 8 runs in the 3rd inning. With time expired in the bottom of the inning, Smoke 12B rallied to score 9 runs and take home the trophy. Erika Beakey went 3-3 at the dish. Zoey Figlenski showed off her skills as a slap hitter, going 1-2 with a single, an RBI and a walk. Melissa MacDonell, going 3-3, led the team with 4 RBIs and had the winning, walk-off hit. Every player on the team contributed to the win and they are proving to be a force to be reckoned with within the travel ball world. Great job SMOKE! Way to battle! 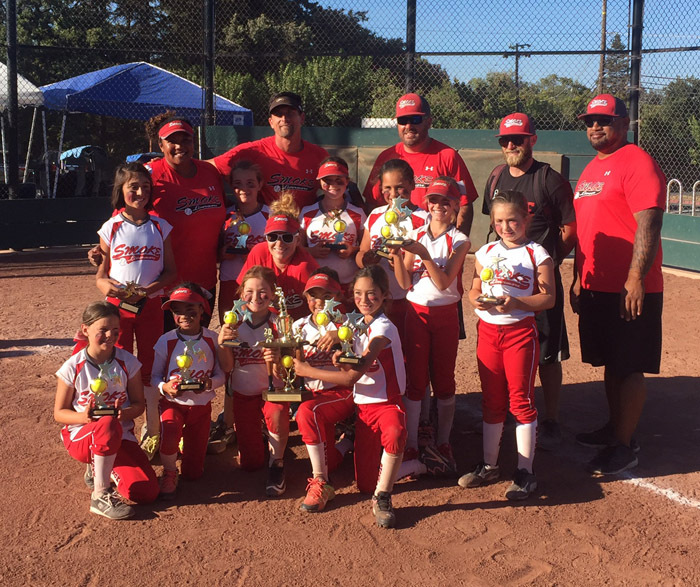 Benicia, CA- The Livermore Smoke 10B Summer Travel Ball team takes 2nd Place at the Del Holson Fast-pitch tournament in Benicia, CA. A shorthanded Smoke team took it on the chin on Saturday winning one game against a solid Santa Rosa Red Barons 3-2 in walk-off fashion. 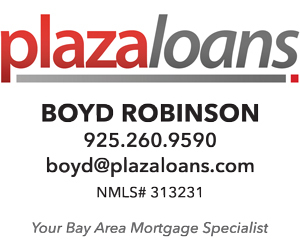 Losses to Pleasant Hill Panthers and Pleasanton Phantom made for a tough road to hoe on Sunday. 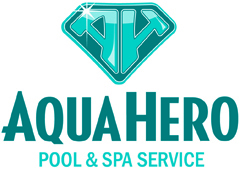 Starting 8:00 AM on Sunday Smoke avenged the loss to Pleasanton Phantom by a score of 15-3. Off to the Semi Finals against the #1 Seeded All American Sports Academy. An exciting game that saw the ladies from Smoke erase a 7-2 deficit and win 8-7 as time expired propelling the girls into their second straight Championship game. 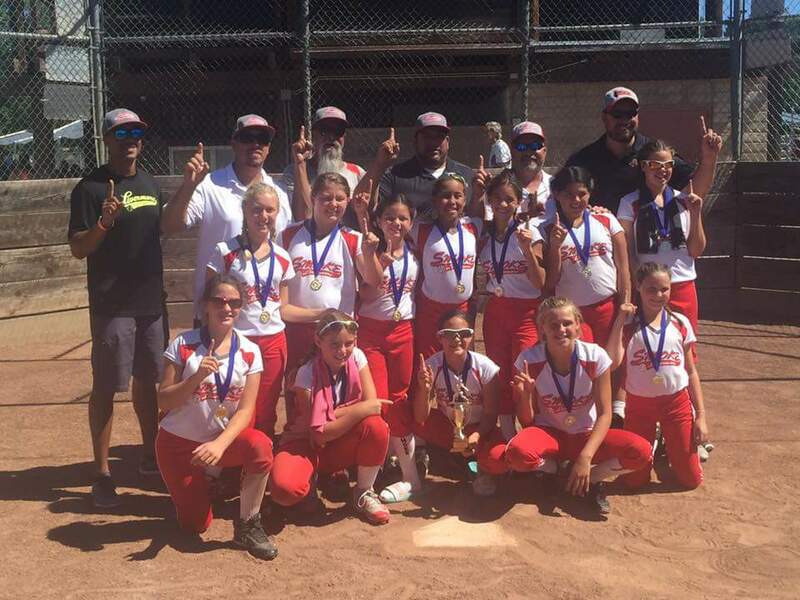 The #2 seeded San Jose Quicksilver took the championship game but that did not overshadow a hard fought weekend of softball for the young guns from Smoke. Smoke was led offensively by a host of batters that posted above .400 batting averages for the weekend: London Moody (.500), Kaitlyn Aguilar (.500), Alizabeth Ruiz (.417), Hailee Hartman (.400) and Jae Cosgriff (.400). On defense Smoke was led by Delilah VanderBeek and Sierra Black with fielding percentages approaching (.900). Kaitlyn Aguilar managed to pitch to a 3-1 record with 23 strikeouts in 15 innings of work. Alizabeth Ruiz threw out 7 runners attempting to steal bases. This 2nd place finish comes on the heels of their Championship in the Smoke Memorial Day Tournament. A great showing for their first two tournaments of the Summer Season. 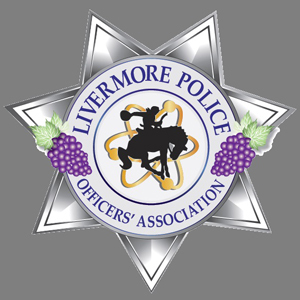 Livermore SMOKE hosted their Annual Memorial Day Tournament on May 28th - May 29th, 2016. Aaron Castro's 12B SMOKE team took home the Championship, going 5-1 on the weekend. Saturday, SMOKE saw their only loss to MVLA Nova, but came back swinging against San Lorenzo Heat and Pleasanton Phantom 12B. SMOKE put Heat away early with 8 runs in the first three innings and holding them to zero runs. Erika Beaky went 2-2 with two singles and Emma Hatcher came up big with a triple and a RBI. Against Phantom 12B, SMOKE outlasted several lead changes to win 9-6. Iliza Shields had 3 of the 6 RBIs for SMOKE. On Championship Sunday, SMOKE defeated Phantom 12C, 16-2 behind Melissa McDonell's strong mound and plate appearances. In the four inning game, she racked up four RBIs on two hits and kept Phantom 12C to just two hits, had three strikeouts, one walk and no earned runs. Sadie Wolfe, Kendall Waugh, and Nayeli Tia all had two RBIs. Behind eight hits, SMOKE won its second game of the day against San Mateo Slammers. Sadie Wolfe was hot at the plate and the on the bases that game; she singled, had an RBI, a scored run and stole home. SMOKE and Phantom 12B met again in the championship game. Phantom came looking to avenge their earlier loss to SMOKE, but after an almost three hour game, SMOKE came out on top 13-12. Both teams lit up the scoreboard with 36 hits, including seven extra base hits. SMOKE led the charge at the plate and on the basepaths with 21 hits and 12 stolen bases. Kendall Waugh went a perfect 4-4 at the dish and Keana Castro (Lincoln) and Nayeli Tia went 4-5. SMOKE's outstanding defense yet again proved that they know how to stay calm and make plays. Ahead by one run, SMOKE's defense worked out of a no-outs, bases-loaded situation, with the last out coming by way of first baseman Karen Castro's great catch and swipe tag of the Phantom runner. Livermore SMOKE 12B started off their season strong here at home and hopes to continue to succeed at their upcoming tournaments this summer. Livermore, CA- The Livermore Smoke 10B Summer Travel Ball team WINS the Livermore Smoke Memorial Day Softball Tournament. The girls played inspired softball the entire weekend. A 3-1 Pool play record on Saturday was backed up with 3 impressive wins on Sunday to complete Smoke’s Championship march. The Championship game against the San Ramon Stompers was a nail biter. Smoke came from behind on two occasions, creating a tie game after six innings. In the top of the 7th inning Smoke was able to rally for 3 runs and held the Stompers scoreless in the final half of the inning. 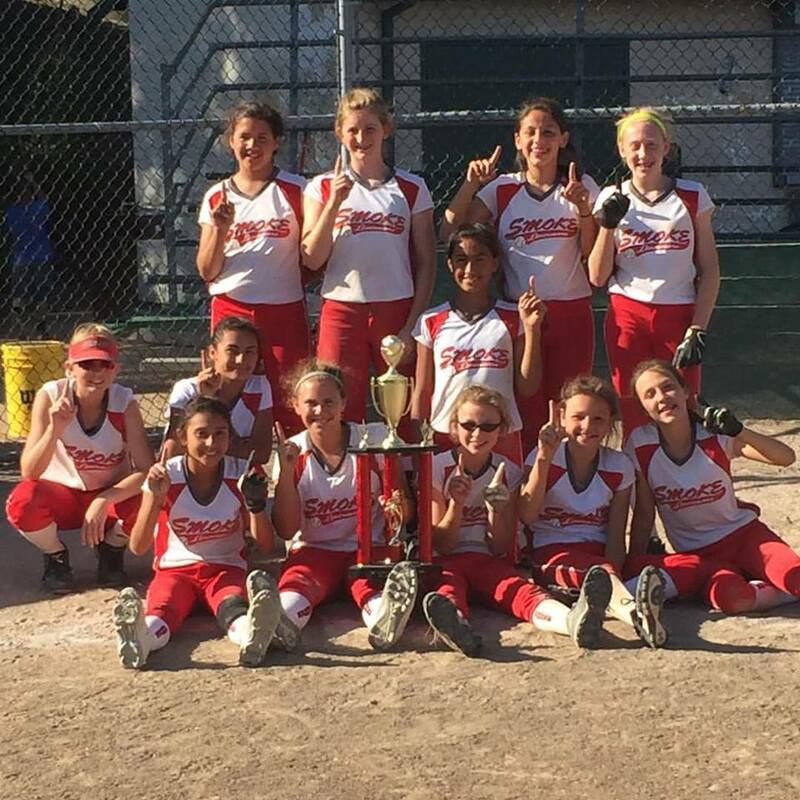 In doing so, Smoke 10B kicked off their travel season with its first Championship of the Summer. Great pitching, explosive hitting and aggressive base running paved the way for the ladies from Livermore. Alizabeth Ruiz led batters with a .778 batting avg. with 2HR’s and 3 triples over the weekend while Kaitlyn Aguilar 4-0 struck out 29 batters and Sierra Black had a 1-0 record with 13 Strikeouts . (Smoke 10B: Top Row; Rhiannon SanMiguel, London Moody, Sydney Aguilar, Kaitlyn Aguilar, Jae Cosgriff and Sierra Black. Bottom Row; Hailee Hartman, Delilah VanderBeek, Maggie Robinson, Alizabeth Ruiz, Audrey Sweet and Sophia Raridan. (Manager: Elvis Aguilar. Coaches: Eric Sweet, Dave VanderBeek, Dan Ruiz, Steve Black and not pictured Rigo Zapien, Julian Cosgriff). 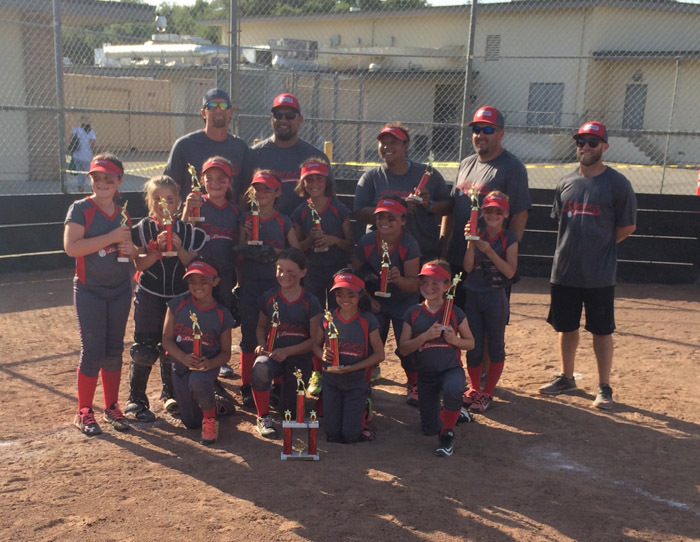 The 8U B Smoke team took home the championship over Pleasanton Phantom by a score of 3-2. Over the weekend, the girls compiled 43 runs while their pitching held their opponents to just 11 runs on their way to a 6-0 record. It was a wonderful way for these girls to start the summer season and grow together as a team that just formed earlier in the month.